In this printable game, it is your job to make sure that the love letter gets delivered. 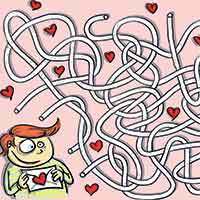 Pick your way through the tangle of paths, finding the one that will lead straight to the heart of the lucky lady. An answer sheet is included in the download so that you can check your work.